Siding/Exterior Cladding - Eby Exteriors, Inc. Along with your roof, the exterior cladding of your home (siding, stucco, brick, stone, etc.) provides your home with the largest area of protection from harsh weather. But unlike your roof, it is much more likely that moisture will enter your home UNDETECTED through your siding. Most roof leaks cause visible damage (though not all – see #1 in series) and are repaired before the leak can wreak too much havoc. Leaks in a home’s exterior cladding can often go undetected for years because they are isolated within the exterior walls. Then when they are found, it is only after substantial damage, and in some cases even dangerous structural damage has been done. Holes created by pests, rodents, birds such as boring bees, squirrels, woodpeckers, etc. Whatever the reason, it is extremely important that you as a homeowner do everything you can to make sure that your siding/exterior cladding is preventing moisture from entering your home. 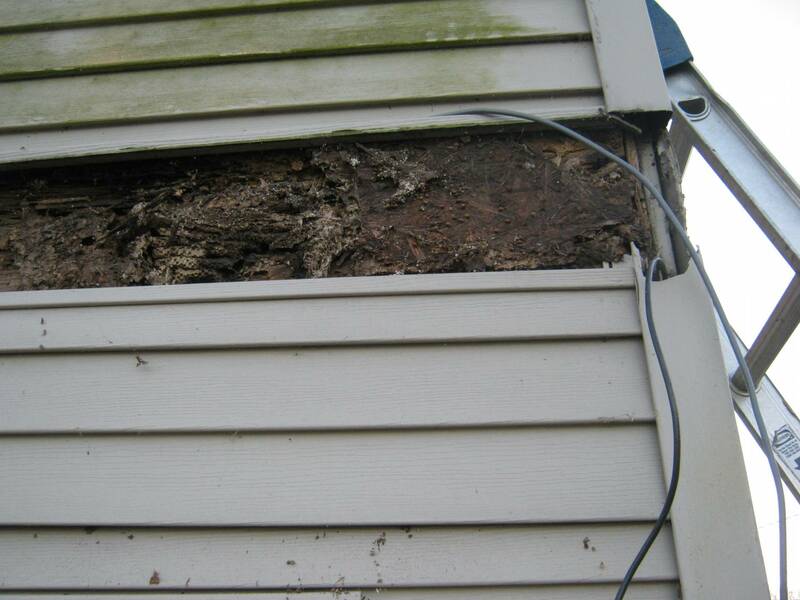 What can you do to prevent water damage to your siding/exterior cladding? The simplest thing (and one of the most effective) that any homeowner can do is to take a walk around your home and look for cracks, gaps, and holes. These are often the most common ways that moisture gets behind your siding or exterior cladding. Pay special attention to areas around windows and doors where cracks often show up. But also look at the areas of flat, open wall. Are there any gaps between two pieces of siding? Or maybe you’ve never noticed those holes from the wood-boring bees because they’re on a side of the house you rarely go to and you simply don’t look up there. Also, if you have any type of masonry on the exterior of your home, check out the mortar. Are there cracks in it? If you have stucco look closely for hairline cracks in it. Remedy – Many of the gaps, cracks, and holes you’ll find can be easily handled by applying a high-quality clear or color-matched sealant, available at any hardware store (Spend the money for the good stuff – it’s absolutely worth it!). If you’re not comfortable doing it yourself you can hire a handyman or capable contractor who can apply it to you. He/she may even be able to repair it without using sealant. Beyond those visible cues, it can be very difficult to tell, particularly for the typical homeowner, if there are moisture problems behind your exterior cladding. My recommendation is to hire a professional to take a look at your home, even if it is only a few years old. Poor workmanship is poor workmanship – even if it only happened a couple of years ago. A professional will be able to see signs of the type of overall workmanship on the exterior of your house that would give her a comfort level of knowing things were done correctly or cause her to suspect that there could be hidden problems. And, in the case of your home’s exterior cladding, an ounce of prevention (or detection) is truly worth a pound of cure! Eby Exteriors is offering a current special of $99 Water Kills Houses Home Inspection. Stay tuned for the final installment of our Water Kills Houses series, Ventilation.